Mention the name ‘Barry’ to any railway enthusiast and they will instinctively know the location and its place in British locomotive history. 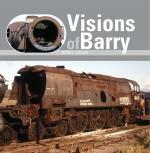 Barry in South Wales was the location of the famed Woodham Bros scrap yard, to which hundreds of redundant steam engines were consigned from British Railways in the 1960s. Of these, well over 100 were destined to be saved and many have been returned to operational service on today’s heritage railway lines. Barry of course was just one scrap yard amongst many around the country and as far as sheer numbers was concerned it was certainly not the most prolific destination for withdrawn engines, although it remains the best known. Many of the locomotives that arrived here would still end their days recycled into the washing machines, motor cars, razor blades and tin cans of the next generation. However, what made Barry so remarkable was that the engines here were not all reduced to scrap as soon as they arrived and instead many survived, albeit slowly discarding various pieces of metal and odd components as the ravages of the sea air and the efforts of souvenir hunters took their toll. Later, a first generation of preservationists began to rescue locomotives from Barry to lay the foundations of the UK’s railway heritage movement. This new book is a poignant reminder of what the Barry location looked like when lines of redundant steam engines stretched as far as the eye could see, standing buffer to buffer often almost as if in a last embrace. As well as showing the pre-preservation state of some surviving locomotives, it records the final days of other once proud steam engines, made redundant by the march of time.